When decluttering your house, begin with your closet, where you don't have to consult anyone else about what to discard. There is a method, but no madness, to the type of minimalism espoused by Cary Telander Fortin and Kyle Louise Quilici. 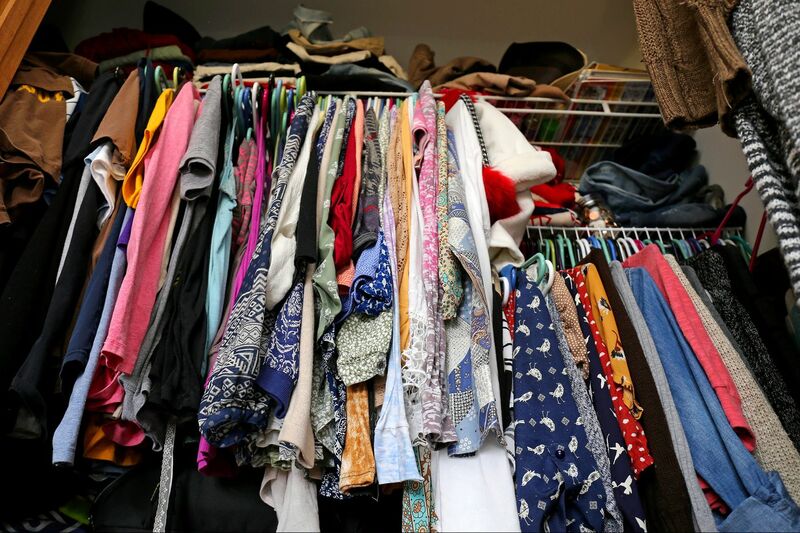 The organizing experts and authors of New Minimalism argue for something a little more practical than a strict 37-piece clothing wardrobe or a monastic-looking house. "It's not extreme, not hyper-industrial, not only for single men, but for everyone, and looks however you want it to look," Fortin says. She and Quilici started developing this more practical take on the less-is-more lifestyle when they met at a 2011 yoga retreat in San Francisco. They discovered they were seeking a slower, calmer life; Fortin wanted to leave her corporate job and learn to live within new means, and Quilici was trying to put sustainability into better practice. Their mutual passion turned into a blog, the book and, in 2013, a business, also called New Minimalism, that helps clients find their own decluttering way. Fortin and Quilici are more about ending the cycle of "busy" than creating a perfect house. As Quilici explains: "Minimalism is a tool that you use to uncover what it is you want most in life and to get that space to breathe. It's not the goal," but a way of prioritizing "working within the space of 24 hours a day, seven days a week." So how does this kinder, gentler method work? The two have some tips. Identify your why. Before you dig in and sort your shoes, ask yourself why you are doing it. "Why is now the right time? What are you hoping to get from this? What do you want your space to feel like?" says Fortin, who lives in Boise, Idaho. "If you start decluttering before you know the answers, you'll get lost along the way." The clients who are clearest on their priorities are usually those going through a transition, she explains, such as an illness, a divorce, or a new baby. They're saying, "I want my stuff to work for me, instead of me working for my stuff." Have someone with you. "It's great if you can have a friend with you, rather than a partner who is invested," Fortin advises. "Find someone who can bag up the stuff, donate, mend … and someone who can say, 'I know you love that, but there's a hole in the armpit.' You want someone honest and kind." Start with your closet. The best part about beginning with your clothes is that "you don't have to get buy-in from partners or kids," Fortin says. "You can lead by example, and it's a great, clarifying, universal place to start." Then go category by category. "We recommend the deep-dive approach," Quilici says. "You do one category of things so that you're done. Get back to zero. If you don't have time to go through all of your clothes in one day, pick one subcategory that you can go through all at once: all jackets and tops. Then you can see the volume of what you have." Define what full is. Start with your boundary before you pare down. Tell yourself, "This house is big enough for my family," and then make your stuff fit in it comfortably. Or say, "This drawer is enough for my socks," and discard solo, holey and uncomfortable socks until your sock collection fits comfortably into that drawer. Once you've decluttered and you later open a cabinet or closet, enjoy the breathing room, and tell yourself this is what full looks like. Let one stand for many. Clearing out the sentimental items is usually the hardest part of simplifying, so Fortin and Quilici suggest letting one special item stand for a memory or person. If your grandmother collected china but you have neither a love of china nor the space to store it, maybe keep a favorite teacup and saucer to remember her by, Fortin explains. "You have to think, 'My grandmother isn't in this china.' "
Fewer things can mean better things. "You have to have durable, well-made things if you want to rely on two pairs of jeans and you wear them every day. There's a little bit of an investment there," Quilici says. In the long run, though, she and Fortin say, they hope for a philosophical shift in thankfulness and appreciating what we have. "We're coming from a place of gratitude," she says. "It's a privileged conversation." Minimalism is really about time. "We work with a lot of families where both parents work," Quilici says. "If you want to know someone who knows how precious time is, it's those families." Think about what you would rather spend your time on than hunting for something in a drawer or organizing on the weekends. This motivation will help you get started, do the deep dive, and then commit to the maintenance.